This official ACDC features High Voltage, the name of the hard rock group's debut album. 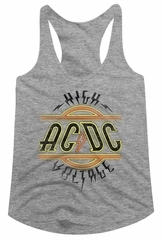 AC/DC sprang to rock stardom with High Voltage, which included the instant hits Live Wire, T. N. T. and It's A Long Way To The Top. Buy yours today!